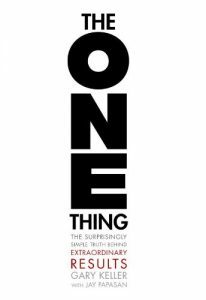 I just finished reading The One Thing – The Surprisingly Simple Truth Behind Extraordinary Results. Many of these types of books promote the same general idea…what do you want and here is how you make a plan to get it. I still enjoy reading them because there always seems to be one nugget of information that is in their book that is not present in the other personal development style books. This book focuses on finding the ONE thing you can do such that by doing it everything else would be easier or unnecessary. I love it. I am the kind of person that becomes easily overwhelmed by large task lists. A Disciplined Life – You need just enough discipline to do the right thing. It is not about doing everything right. Willpower is always on will-call – It is strongest in the morning and dwindles as the day goes on. Willpower, pretty much is consistent with your level of energy. A Balanced Life – Magic happens at the extremes, not in the middle. The secret is not to remain at these extremes too long. Big is bad – The truth is, thinking big is essential to extraordinary results. Big gives you the best chance for extraordinary results today, tomorrow and every day from here on out. This is book is about focus being broken down into its simplest form. You look at the big picture and decide what is the ONE thing you want for your career, your family, your life or any other thing that is important to you. For me, it is about making a living online. Part two of the focus is what can I do right now that will help me achieve my ONE thing. For me this is about automating processes for building my websites and increasing traffic to them. With that said, there are a lot of tasks in getting that done, so I have to further breakdown what it takes to find the ONE thing. There can only be ONE – this is the one thing you can do right now. Goal set to now – Knowing what your future goal is will help you identify the steps you need to begin now to reach your future goal. Put pen to paper – right your goals down and keep them nearby. The last part of the book is about time blocking. This is a process that is going to assist you in making the time it takes to work on your ONE thing. The author recommends you set aside a 4 hour block of time each morning for working on your ONE thing. He also recommends that you block an hour each week to review your annual and monthly goals. So, now you have a block of time set aside for working on your ONE thing and you have an hour set aside to review what you are doing each week to see if you are on track. Now, it is time to protect your time block. This about staying focused. Identify the distractions and eliminate or reschedule them. The ONE thing is a relatively simple concept and can used in most any area of your life. Have something you want to accomplish? Why not use the ONE thing concept for achieving your goals.